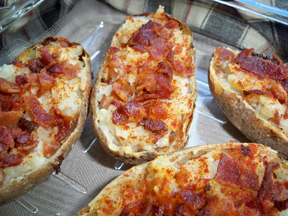 This works well for leftover baked potatoes. And is great for guests as they can be made in advance to put in the oven later. 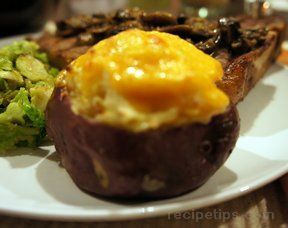 Bake potatoes in oven for 1 hour or until done at 350Â°. Cool for 10 minutes. Cut an opening in the top and scoop out the flesh. Add sour cream, milk, butter, salt, pepper and half of the cheese. Stir in the scallions and bacon. Mix well and spoon back into the potato shells. Top with remaining cheese. Bake for another 15 minutes. 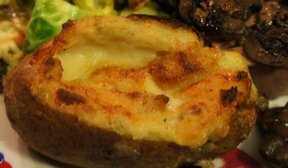 NOTE: These potatoes also freeze well and can go straight from the freezer to grill wrapped in aluminum foil on the bottom half of the potato or in the oven for an hour. "These were good. 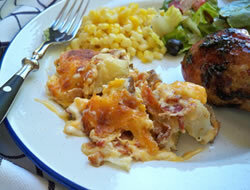 I liked how the potato skin got crispy and the potato mixture was light and creamy. I will stir in all the cheese next time since I didn't care for how crisp the cheese got on top."